Krugerrands take their name after the former South African President, P. Kruger, and the name of the national currency. The first coins were struck back in 1967 and at the time were almost the only physical gold bullion products available on the world market. However, the first coins appeared on the American market only in 1974 when Americans regained their right to physically own gold. Currently these coins are considered one of the cost efficient ways to buy gold bullion investment due to their high ratio of cost to value. Surprisingly, the dealer premiums for these products are low. If you want to buy gold Krugerrands the first thing you need to do is find out what your available options are. The original coin with this name was a 1 oz gold Krugerrand minted by South Africa, but since this original coin was introduced there are now fractional sizes, but you will pay a higher premium for the smaller sizes. Gold Krugerrands are now available in the original one troy ounce size, or you can choose from one half of a troy ounce, one fourth of a troy ounce, and one tenth of a troy ounce coins. These smaller sizes make it easier for any investor to purchase and own Krugerrand gold bullion, even with smaller budgets. The smaller fractional sizes will cost more though, so the best investments are still the Krugerrand gold coins which weigh one ounce, because the premiums for these coins are so low compared to other bullion coins of this class. 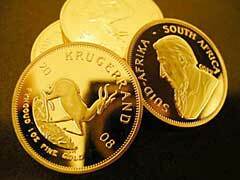 With the market price of gold at record highs, gold Krugerrands are a fabulous investment that offers many benefits. Knowing your options can help you choose the biggest size your budget will afford, so you pay a premium as low as possible. The next step is determining what the best way to buy these and other coins is, including those from other countries like British sovereign gold coins and others. You can visit precious metal dealers in your area, or you can use the Internet to find quality dealers all over the country and world. Finding a highly reputable seller will ensure that you receive authentic products at fair prices. Gold bullion is a very popular investment right now, and a very profitable one in many cases. Krugerrands are a known and secure form of gold to invest in. There are many options when it comes to gold Krugerrands, and you need to know what they are before you can make an informed decision concerning your investment capital.